Discussion in 'Tutorials and How Tos' started by Cody2003, Jul 7, 2007. 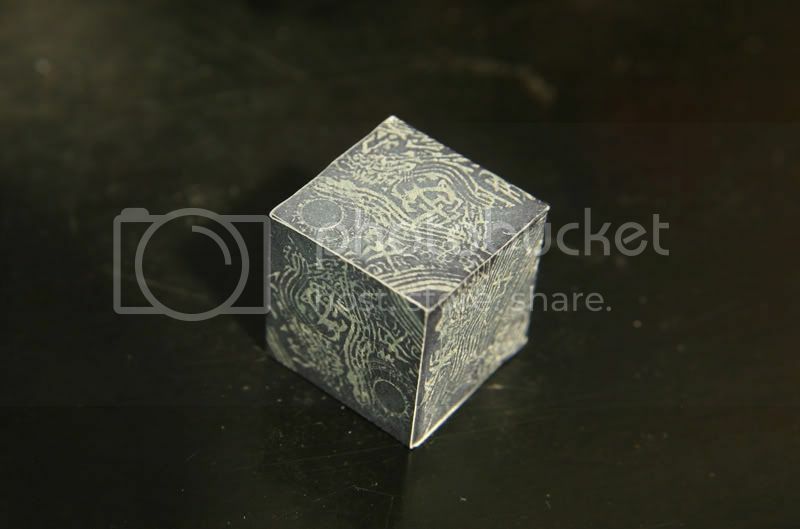 I decided to try and make something that would be more in scale with the movie figs, and still be nicely detailed, so I decided to scan and repaint the allspark texture on the cubes, and then apply that texture to one of the individual cubes that make up the single puzzle so that it would be able to fit into the movie figs hands. the end result is still larger than the actual movie prop, but it's close enough until I find a die or something smaller. Here is the original cube. and the final result, basically I just replaced the stickers with one of my own that makes the textures to scale. 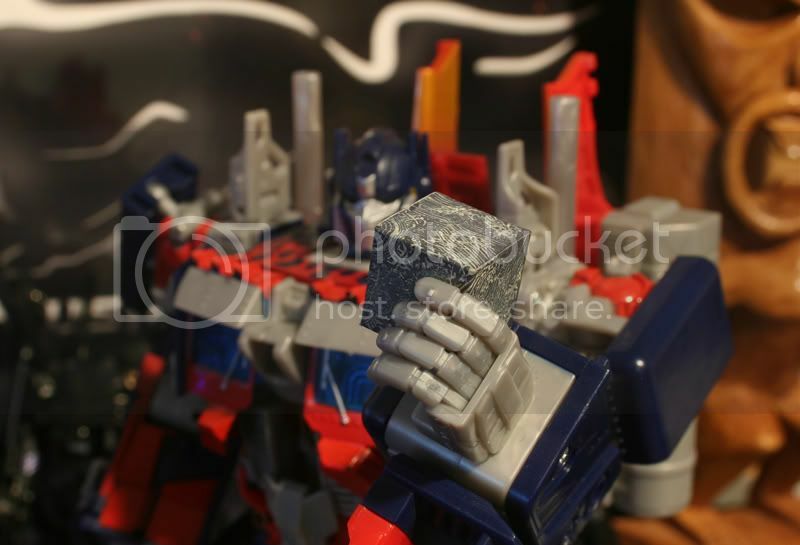 and to show the scale, one held by leader prime. Here are a couple of .jpgs. these files are in 300dpi, and will directly fit on a cube 1 3/16" (twice the size of the cubes I ended up using) so you will need to measure whatever cube you want to use and scale accordingly. now for a question....... Any recommendations for a sealer I can use on these stickers? they are just plain inkjet labels, and I would like to seal them so that the color is more rich, and so that they will stand up to abuse a little better. 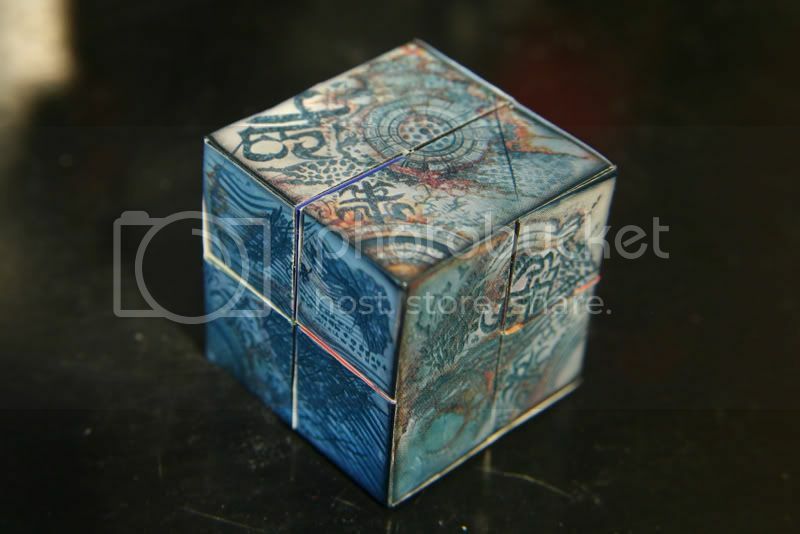 as for the other 7 cubes left over........ as soon as I find some metalic pink spray paint I'll have some new energon cubes. [update] here is the psd (photoshop) file.